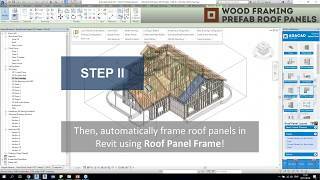 Wood Framing Roof lets Autodesk® Revit® users instantly create prefabricated wood frame roof panels, wooden truss and/or rafter systems of any shape or complexity, perform structural analysis, and generate custom shop drawings. Connectors, cuts, supports, tension braces and other details can be distributed based on predefined rules or connection types. They can then be modified or updated to suit the project design stage and the level of detail required. The layout and details of roof structural elements can be modified and updated whenever the project is changed. Easy marking of trusses and rafters based on properties and location ensures accurate bills of materials and accurate assembly. And information for fabrication can be automatically generated with all desired views, schedules, and drawings for each structural element. The trial version and full version are both included in the Wood Framing Roof App. After downloading the app, you will have the option to take a free 14-day trial or to purchase. Activation codes are sent via email. By downloading the Wood Framing Roof App, you will also receive our TOOLS4BIM Dock. 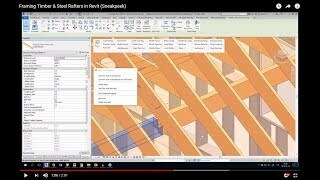 The Dock gives you the option to install additional Revit add-ons developed by AGACAD. These other Revit extensions cover a range of industries, including Metal & Wood Framing, Ventilated Facades, Curtain Walls & Panels, Precast Concrete, MEP, and more.